Palm Beach Gardens, FL — The Honda Classic has achieved new charity milestones for the 10th consecutive year. The Honda is awarding a record $3.212 million to local children’s charities during Honda Classic Cares Week July 11–15, obliterating the previous mark of $2.55 million that was distributed in 2015. This 2016 giving includes an unprecedented individual grant of $1 million to the Nicklaus Children’s Health Care Foundation. The funds generated by Honda Classic Cares on behalf of the Foundation are donated annually to Nicklaus Children’s Hospital to advance pediatric care in the Palm Beach community. This year, Nicklaus Children’s has designated that the funds jumpstart a campaign to build a new dedicated pediatric emergency department at Jupiter Medical Center as part of the facility’s Nicklaus Children’s Hospital partnership. The record charitable distribution and the largest single grant in tournament history are a continuation of the monstrous growth the PGA TOUR event has crafted since moving to PGA National Resort & Spa in 2007 under the direction of Children’s Healthcare Charity, Inc. The Honda is awarding grants to 50 different local charitable organizations, impacting the lives of more than 30,000 children. Some of the initiatives evolving from that giving range from contributing to the state-of-the-art Els Center for Excellence for autistic children in Jupiter to After-School and summer programs for kids at Adopt A Family of the Palm Beaches to a restoration of the Village Program of Scouting with the Gulfstream Council Boy Scouts. The Honda Classic sponsors summer camp for 35 kids at the YMCA of the Palm Beaches, an art education program for underserved youth at the Artist Showcase of the Palm Beaches, Cystic Fibrosis patient care at St. Mary’s Medical Center, caregivers for abused or neglected children at Grandma’s Place, Inc., a $10,000 golf scholarship at Palm Beach Atlantic University, food for kids at the Palm Beach County Food Bank and is making a major contribution to the creation of a 250-seat auditorium at the Leadership Academy of Urban Youth Impact. An additional 101 charities received proceeds from the American Honda Birdies for Children program, where fans donate for the chance to guess the number of birdies in the tournament. American Honda awards a new Honda Civic LE to the winner. Fifty-nine individuals guessed the proper birdie total of 1246 in 2016 and the car will be awarded by drawing at a reception for charity partners on July 11. Honda Classic Cares Week is a celebration of the impact the tournament is making in the community. Many of the organizations benefiting from grants will receive site visits from Honda Classic representatives throughout the week. “It was another spectacular year,” Honda Classic Executive Director Kenneth R. Kennerly said. “Our continued success is a tribute to the immense commitment for the past 35 years from American Honda, our two founding partners Tire Kingdom and United Technologies, other sponsors, volunteers and our great fan base that continues to support the tournament each and every year. Nicklaus Children’s Health Care Foundation, the main beneficiary of The Honda Classic, is a not-for profit Foundation dedicated to providing children and families access to world-class health care. Established in 2004, the Foundation has raised tens of millions of dollars to advance and enhance pediatric health care – most notably for Miami Children’s Hospital. In honor of the generous support from the Nicklaus Children’s Health Care Foundation, Miami Children’s flagship hospital in Miami, which has already served millions of children from around the world, along with its network of outpatient centers, was renamed Nicklaus Children’s Hospital. Through the support from the Foundation, a pediatric partnership between Jupiter Medical Center and Nicklaus Children’s Hospital was established; paving the way to make world-class pediatric care accessible to residents of Palm Beach and Martin counties. Earlier this year, the partnership commenced with the opening of the Nicklaus Children’s Hospital De George Pediatric Unit at Jupiter Medical Center. 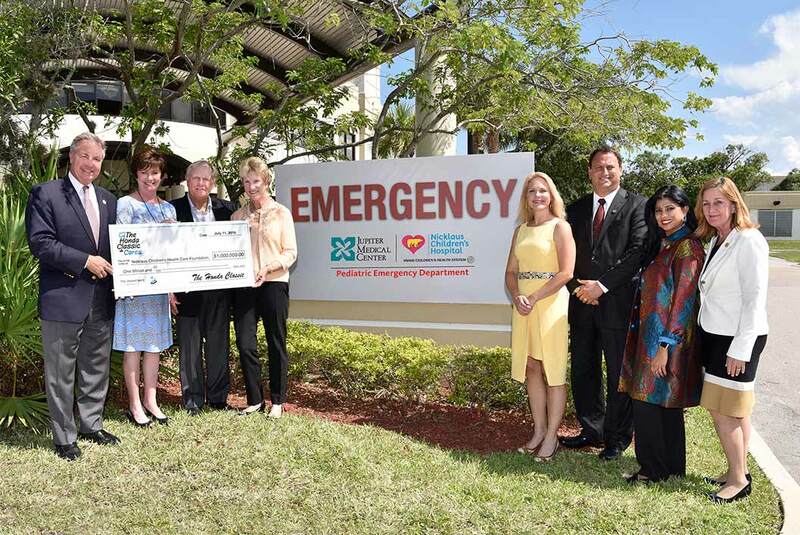 Now, with the support from The Honda Classic, the $1 million grant serves as the campaign catalyst to build the new pediatric Emergency Department. The gift to Jupiter Medical Center is the lead donation for an eventual $5 million project. It was the logical next step for the Center as it expands upon its relationship as a pediatric partner with Nicklaus Children’s Hospital. When The Honda Classic moved to PGA National Resort & Spa in 2007, it awarded $505,000 to charity. By 2010, it had eclipsed the $1 million mark ($1,018,000) and it broke through the $2 million barrier in 2013 with $2.114 million in contributions. Now it has surpassed the $3 million barrier. The growth is a testament to American Honda’s 35 years as the longest-standing title sponsor on the PGA TOUR as well as partnerships with PGA National Resort & Spa, PGA of America, Palm Beach County, the City of Palm Beach Gardens and the PGA TOUR along with the support from major local partners such as Tire Kingdom, United Technologies and FPL. Player, corporate and spectator support has led to increased ticket sales, parking revenues, concessions and sponsorships. The 2017 Honda Classic will be played February 20–26, 2017, with Adam Scott defending his title.